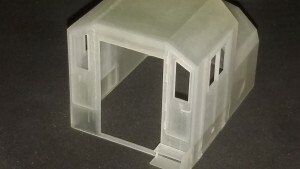 The cab will be upgraded from time to time to include (much) more details. The photos above and below show the Cab as it came out of the packaging. 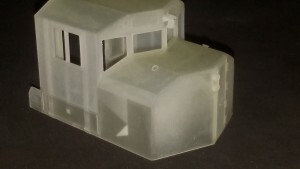 I didn’t apply any treatment to prime the material for painting or cleaning the rough edges inside the window cutouts so far, the this is essentially what you get. 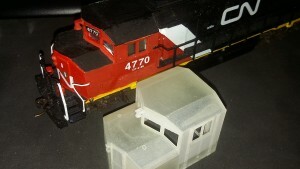 The GP38-2W shown in the first photo above has a kitbashed variant of the cab (made from sheet styrene). It is the reason I designed this cab in the first place. 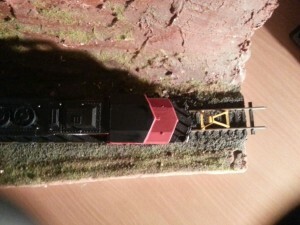 By the way, this is how the prototype looks like, after which it was modeled. Primed and painted cabs. 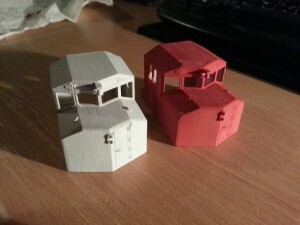 The red one is the test-print, the primed one is the upgraded cab, which is already replaced by the 2nd Upgrade Cab. 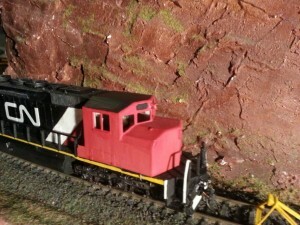 I installed my cab on an old Mehano SD40-2 to see if the cab is somewhat useable. Now, this is the first generation test-model sans improvements and thus I didn’t want to risk a better model for this rebuild. 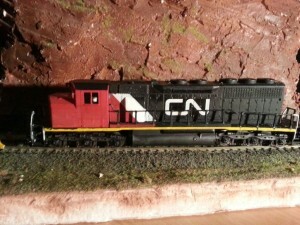 Matching CN 5353 prototype photo. 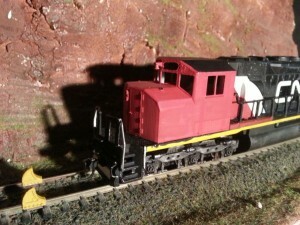 However the SD40-2W – to my limited knowledge – featured either the “Sergeant Stripes” or the “North America” paint scheme. The “CN Noodle” variant of my model wouldn’t depict an actual prototype. But that is actually only a decal away.